The main premise of the post was that Facebook was reducing its organic reach. In fact the numbers showed it was trending to zero. We now have new gatekeepers. They are the platforms and their algorithms. Facebook and Google. The web is now run with code that strangles traffic and promotes what the platform sees as being in its interest. Today the web has turned into a battle of the algorithms. In looking my Google Analytics data, I compared the traffic from Twitter from 2 years ago to today. Despite increasing Twitter followers in that time period the numbers are telling. With any communication network there comes a time when it is less effective. Declining email open rates and social media engagement are great examples of this. More platforms. Instagram and SnapChat are the shiny new toys and some of the older ones are being abandoned. New algorithms. Twitter and its cohorts have throttled organic traffic an endeavor to maximize revenue. So the platforms push is still moving to pay to play. And sharing content on social is still important. But today there is no big magic bullet. It is more an incremental journey of ongoing optimization and experimentation. Continuing to optimize and invest in your website, having a multi-channel strategy and constant experimenting are all in the mix. Here are some of the things we are currently doing and experimenting with. Last year we realized the website needed some investment. I had built traffic with blunt force trauma and had neglected the finer arts of SEO. Looking after your primary digital asset is essential. So we focused on two core things. These are the pillars of SEO. Technical– Fixed and optimized the technical aspects of the site to ensure that search engines loved us. The results are telling. Organic search is up over 41% in just 12 months. Despite our major project of optimizing and investing in our search engine organic traffic growth we are trying a few other tactics. Pushcrew is one, Flipboard is another and the other is something a lot more strategic. A Facebook Messenger Bot. This is quite a new initiative but it is encouraging. To put it simply PushCrew is a RSS1 driven alert that is requires a small bit of code to be loaded onto your site. People can subscribe to your PushCrew alerts via an initial small pop up. After subscribing it triggers a small pop up at the top of their browser every time you publish a post. It’s quite non-intrusive and subtle and it works. We have been running this for about 4 weeks and so far it has produced over 1,000 subscribers. Not only that but we are starting to see a nice incremental growth in traffic. 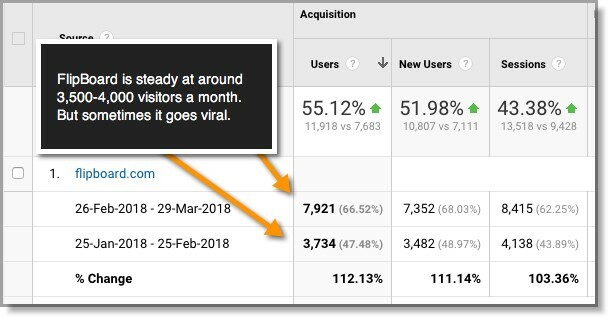 It is not big at the moment and ranked #16 as a traffic source with only 461 users visiting our site ever the last month but that was from a standing start. But the last week has seen a total 348 visitors. That moves it up to being ranked at #7. But projecting out to 12 months the traffic potential becomes very promising. If we reached 12,000 subscribers by growing at the current trend line of 1,000 a month then 12 times last week’s traffic = 4,176 visitors a week or 18,493 visitors a month. 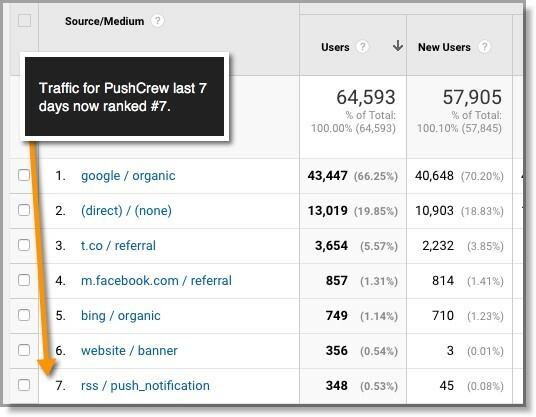 So it is possible that this PushCrew traffic tactic will blow past Twitter (currently 3,654 per week) as the 3rd largest source of traffic. About 4 years ago I created a personal Flipboard magazine where we posted or “flipped” the latest blog posts. It takes just a few minutes to set one up and then a few seconds to flip your new post into the magazine. Traffic per month sits around an average of 3,500 to 4,000 visitors. But sometimes FlipBoard drives a ton of traffic. They are usually more “success story” type of motivational and inspiring personal growth and self-development articles. The platforms audience seems to love that category type. 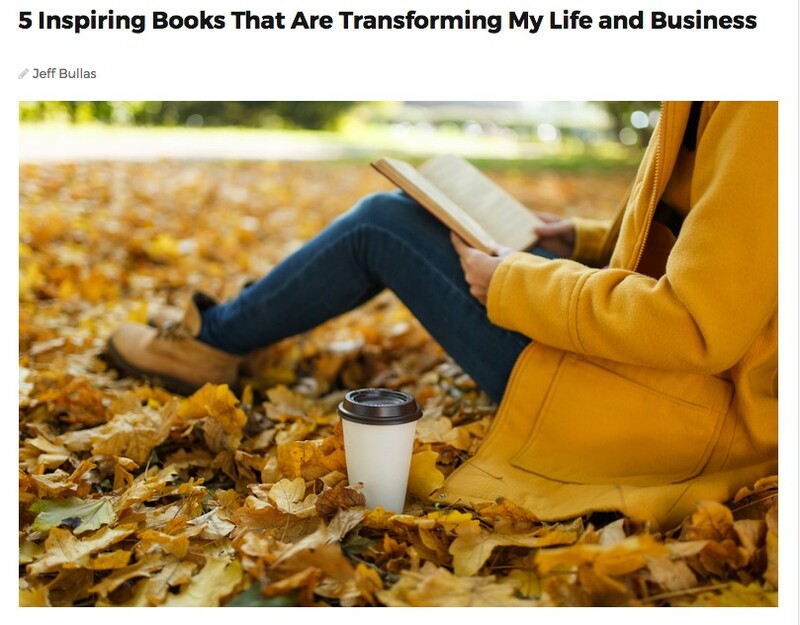 On Monday and Tuesday the 5th and 6th of March it drove a total of 7,260 visitors in just 2 days and so far the article “5 Inspiring Books That Are Transforming My Life and Business” has received over 14,000 views. So for us FlipBoard has certainly been worth doing. Small amount of time investment for a good return. And sometimes you get that little surprise. Viral traffic. Is the future Facebook Messenger? With over 1 billion people on Messenger the audience is large and growing. Also the conversion rates are much higher than email marketing. So we have just implemented a Facebook Messenger ManyChat Robot funnel. The initial goal is to build followers and subscribers on Messenger. This is something we have implemented a few days ago and the Messenger. To kick it off we are not going anything except giving away a free blogging starter kit. So far we have added nearly 100 subscribers in less than 48 hours. So it’s a good start. Again if we project one year out then a subscriber growth rate of 50 a day is 18,250 in 12 months. And that certainly makes it worth doing and investing in. But the most exciting part is that once they subscribe the click and open rates are mind boggling. 84% open rate and a 61% click rate. As we fine tune this and add to our tactics and optimize we will keep you posted about the results. And guess what? It is also a source of free traffic. Is chasing organic traffic a waste of time? So the reality is that free social media traffic is getting a lot harder to get. But it is still worth investing in. 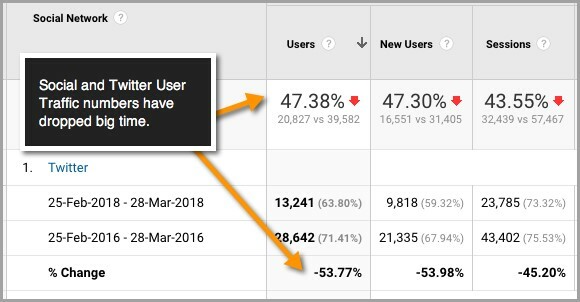 It has dropped from 14.8% of our traffic in 2016 to 8.5% in 2018. And it is still my third biggest source of organic free traffic. But what we are doing is exploring other tactics that work and are effective and many don’t require a lot of time and investment. So what has your experience been and what tactics have you tested to grow your organic traffic?